Whether referring to Eve’s interpreted meaning in saying “The serpent deceived me, and I ate” or Arne Cheyenne Johnson’s claim for why he murdered Alan Bono, the phrase “the Devil made me do it” has remained in the cultural mindset ever since comedian Flip Wilson first popularized the line through his most famous character, the drag persona Geraldine Jones, in the early 1970s. And as this catchphrase flourished over the decades, it would inspire a diverse range of artistic interpretations, including Luke Chueh‘s Possessed. A literal interpretation of “the Devil made me do it” concept, Possessed features Chueh’s signature bear character staring down at his blood-soaked hands in wide-eyed surprise, an Atari 2600 joystick affixed to the back of the beast’s head, a diminutive flying devil at the controls. Initially appearing in painted form, this 2004 depiction would be revisited by Chueh at various times within his oeuvre, such as his Street Fighter II series that merged the idea with iconic attacks from the video game title. 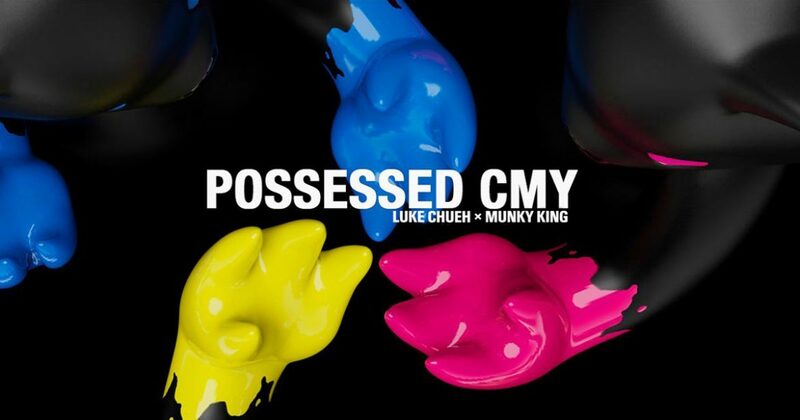 And though the core of this design would be a memorable early highlight for Chueh, it was the Munky King produced vinyl sculptural editions of Possessed that would have, potentially, the greater impact on the artist’s career. Issued to an overwhelming response, with a line of collectors reportedly wrapped around the block awaiting entry to the release event, Chueh’s Possessed was his first art toy. Having been sculpted by Dave Bondi from Chueh’s design, Possessed debuted in May of 2007 with two limited edition colorations with a Monotone variation to follow two months later at San Diego Comic-Con. Aside from a unique, over-five-foot-tall 1000% Possessed resin rendition debuting at Chueh’s Contemptorary Art solo exhibition in Febrauary of 2011 and late 2013’s subsequent 4ft Possessed edition, it would be a decade before the popular Possessed resurfaced in vinyl sculptural form. Making its first public appearance at 2017’s San Diego Comic-Con, the 10th Anniversary Edition of Possessed remained true to the original rendition while incorporating several subtle changes, including sculpted eye depressions, greater articulation, improved joystick wire shape to address prior technical issues, and ommission of the gradient shading from the original’s legs and ears. And aside from revisiting the 2004 painting’s decoration, none of the previous variant colorations would be repeated though entirely new renditions would be explored, such as the CMY Editions. Beginning his work experience while attending the Art & Design program at California Polytechnic State University, Chueh was an in-house designer & illustrator at Ernie Ball prior to receiving his bachelor’s degree with a graphic design concentration in 1997. Given this background, its no surprise that “CMYK was a language”, Chueh admits in the press release, “[that] I saw the printed world in”, referring to the four inks used in some color printing: the greenish-blue cyan, the purplish-red magenta, yellow, and the keyline, or black plate. Appropriately paying homage to this period in his life, the CMY Editions of the 10th Anniversary Possessed decorate the roughly 9-inch tall form in the three obvious colors — the Cyan Edition, the Magneta Edition, and the Yellow Edition — over a black vinyl base. With each coloration limited to an edition of 200 pieces and exclusively available from a different source, MunkyKing have devised a potential reward for those who acquire all three of these CMY Editions versions: a contest to be detailed on the brand’s Instagram page wherein one person will add the previously issued Black (As My Soul) rendition, which was an exclusive from the Grief Encounters Kickstarter campaign, to complete their CMYK collection. Not only a beautiful modernization of what was arguably a career-defining design, these CMY Editions also use the 10th Anniversary Possessed form to pay homage to Chueh’s initial post-collegiate job and the CMYK language he learned to see the world in. On December 7th at 12pm (PST)/8pm (UTC), acquire Luke Chueh’s Possessed in its Cyan Edition from here, Magenta Edition from here, and Yellow Edition from here.